Request Quote Here - Larger Quantities May Qualify for Wholesale Pricing. Tent and Table doesn't own or operate any trucks or shipping service; we receive the best possible discount from our freight carriers, extending lower rates to our customers. Free and flat rate shipping is available ONLY during special promotions and events. Please contact us for more information. Tent and Table's products range from small packages weighing only a few pounds to large freight orders requiring dedicated trucks. Our customer service and logistics teams work diligently to ship your products quickly, accurately, and cost effectively to arrive at your location damage free. Please review the following shipping information to better understand the process. We recommend that you order at least 2 weeks prior to your event date. If you MUST have your product delivered on a certain day and at an exact time, we ask that you arrange to pick up your order from our distribution center. That is the only way you can be 100% guaranteed that your delivery experience will be perfect. We ask that you verify the "Ship To:" address listed on your quote for accuracy. Re-consignment, re-delivery, or storage fees are the responsibility of the customer. Large packages will ship ground freight. You may need a forklift to unload your deliveries. Most of our freight products are very large items (long poles, long skids, heavy materials, etc.). Extra fees will apply for lift-gate delivery. To avoid additional charges after placing your order, please notify your customer service representative if you will need this service prior to completing your purchase. A signature upon receipt is required for all freight deliveries. Any customer who arranges their own shipping (on their account) will be charged a fee of $125. This fee covers the time needed to fill out the additional paperwork required to work with a shipping company not contracted with us. There is no additional charge for customer pickups/self-pickups. As Tent and Table neither owns nor operates freight trucks, we do not have any control over the freight company's driving skills or exact delivery times. Freight rates are subject to change without prior notification. All shipments are loaded on the freight line damage-free, properly packaged for transit, and signed for as such by the freight carrier. Tent and Table's responsibility for the product ends at that point and the freight carrier assumes responsibility. If there is damage, please note the damage on the delivery receipt. Customer inspects the shipment before signing the Delivery Receipt. The Bill of Lading will list the quantity of skids and/or bundles of poles you should receive with your order. Please refer to the Bill Of Lading to confirm you have received the correct number of skids. Customer notes all damage and shortages on the Delivery Receipt. Customer notifies Tent and Table within 3 working days of the shipment's delivery of all damage and/or shortages. Customer documents all damages with photographs. Email the photographs to your customer service representative when initiating claim. Failure to note shortages and/or damages on the delivery receipt and/or failure to notify Tent and Table within 3 working days of the delivery constitutes a waiver of claim. Customer will then be responsible to recover any charges incurred with replacing damaged goods. Freight claims for third party and/or collect shipments are the responsibility of the customer. Enclosed in your shipment you will find a packing list. Please unpack the freight and check your order thoroughly as soon as possible. The freight driver may not be willing to wait while you inspect your shipment along with the packing list provided. Please be sure to confirm all skids and/or bundles that are listed on the Bill of Lading have been received before signing the Delivery Receipt. ANY DISCREPANCIES MUST BE REPORTED WITHIN 3 DAYS OF RECEIPT OF SHIPMENT. 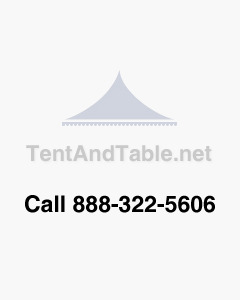 Tent and Table will calculate shipping to the port of export or your Freight Forwarders US Warehouse. Please provide your customer service representative with that information so they may calculate proper shipping rates. International door-to-door service is only available to Canadian customers. We ship from New York. Freight transit times are NEVER GUARANTEED -- PLEASE CONTACT YOUR SALES REP FOR APPROXIMATE TIMES. Will my purchase ship Parcel (Fed Ex or USPS)? Depending on the size of your order, the most economical way to receive your product may be small package. Your customer service representative will help you determine if this is the case. If this is your preferred way to receive your material, some large shipments can be shipped parcel but may have additional charges based on the size. Please see the guide lines below. Packages can be up to 150 lbs (70 kg). Packages can be up to 130 inches (330 cm) in length and girth combined: Length + (width x 2 + Height x 2). Packages can be up to 108 inches (270 cm) in length. Packages with a large size-to-weight ratio require special pricing and dimensional weight calculations. If a package is over 130 inches after calculating the girth, there will be an extra charge. If a package is over 108 inches in length, there will be an additional charge. Most packages of this length will be large enough that both the over-length and over-girth charges applied. Can my small package ship internationally? Yes. Fed Ex delivers packages all over the world, and will process customs duties and taxes for a fee. Why is my order shipping heavy freight and not by Parcel? Most items we sell are too large or too heavy to ship using a small parcel carrier, making the most efficient option to ship using a common carrier or heavy freight carrier. Freight shipments are the best choice for shipments weighing between 150 pounds (68 kgs) and 15,000 pounds (6,800 kgs). For orders greater than 15,000 pounds (6,800 kgs), orders are transported by Full Truck Loads or dedicated delivery. Can I reroute a freight shipment before it has been delivered? Is there an extra charge? Yes, shipments can be rerouted to a new delivery address prior to delivery. A fee will be charged. Please contact your sales representative with your new destination so that additional fees can be calculated. Who will actually transport my shipment? Tent and Table utilizes a network of carriers to provide our customers with the best prices, service, and transit times. The carrier assigned to your shipment will be determined based on this criteria the day your order ships. Specific carrier and tracking information will be available upon request the day after shipment. What is residential/non-commercial/limited access delivery? Can my shipment be delivered to my residence? Are there additional fees? How do I unload the truck? You should assume that your product will be delivered on a tractor/trailer rig that uses a 53 foot enclosed trailer. It is the truck driver's responsibility to make sure that your product is brought to the rear of the trailer, but it is the customer's responsibility to unload the product. The best way to unload freight shipments is at a commercial height truck dock, using a forklift. If this isn't feasible, the product can be unloaded by hand out of the rear of the trailer. Lift-gate delivery may also be an option in some areas, however keep in mind that lift-gate delivery works best with shorter items (less than 72"/1.8 m square), and most canopy tent components are 96"/2.4 m to 263"/4.1 m long, meaning some hand unloading may still be necessary. Lift-gate delivery means that the truck will have a platform on the rear of the truck that can lower to the ground. Tractor trailers are approximately 56" (1.4 m) above the ground, designed to load and unload at a loading dock or with a fork-lift. If your delivery location does not have a loading dock or fork-lift and the item is too heavy to remove from the trailer by hand, a lift-gate will come in handy. Additional fees will apply for tailgate delivery service. The driver will bring any items to the gate for you to unload. You must be available to take the items from there. Lift gates are ideal for deliveries to residential areas, as well as commercial areas that have no docks like stores. Do I need lift-gate delivery? Is lift-gate delivery service always available? No. It's important to ask in advance if you will require lift-gate delivery as most trucks are not equipped with a lift-gate. Carriers are not obligated to provide trucks with lift gates when trucks or operators are not available. Do I need to be present for delivery? Yes. Whether you choose tailgate or standard delivery, you need to be available to sign for the shipment. If you are unavailable at the time of delivery, you may incur a re-delivery charge. It is important that you inspect the freight for any damages and possible shortages on the truck drivers Bill Of Lading/delivery receipt. Will the carrier call or notify me when they are coming? This answer depends on whether the delivery is to a residential or business location. delivery date and time at your location. It is important that the freight company has your cell phone or work phone number so that they can make immediate contact with you and not delay the delivery. You will be able to schedule a "delivery window," or period of time when the delivery may arrive. This allows the drivers to accommodate varying levels of traffic and time at different stops. and the facilities for unloading your product, then you will most likely not receive a call scheduling delivery. Some businesses provide an "arrival call" around 30 minutes prior to the arrival of their truck. This is a service offered by shipping companies, and varies company to company. When on the phone with the freight dispatcher you can ask if they offer these calls. As Tent and Table does not own or operate the shipping companies, we have no control as to whether or not this service is available at any given time. What happens if the products I received are damaged or lost? Should I refuse delivery? No, customers should not refuse their delivery based on damage or shortages. All products should be counted for accuracy and inspected for damage prior to acceptance. If you determine that your shipment has been mishandled in transit, note all damaged and missing materials on the delivery receipt and contact your customer service representative for claims processing or replacement parts. If you do not make a note on the delivery receipt about damage, the chances of a freight claim being honored are very small. Shipping any product carries the risk of the product becoming lost or damaged. Products may be picked up at our Distribution Center to bypass the shipping process. Will Tent and Table replace my order if it is delivered damaged? Tent and Table is not liable for freight claims and damages sustained during shipping, but we will assist customers through the claims process. It is the freight company's responsibility to deliver the shipment in good condition, and the consignee's responsibility to inspect the shipment and notate any and all damages or shortages. If noted, it is the duty of the consignee to file the freight claim. The customer is bound by the carrier's limits of liability per the rules and regulations of the carrier, as noted in their specific tariffs. What does "FOB origin" mean? "FOB" stands for "Free on Board," indicating the point where liability, ownership of the goods, and title for shipment are transferred from the seller to the buyer. All products shipped by Tent and Table are shipped "FOB origin" which means the buyer pays shipping cost and takes responsibility for the goods when the goods leave the shipping point. Can you 100% guarantee delivery time and date? No. Tent and Table can give you an estimate as to when you should receive your product, but we can't guarantee certain delivery times on that date. Can I arrange my own freight pickup? Yes, we can accommodate these requests. There are a few additional steps that need to be completed for customer-arranged freight pick <up. Customer-arranged carriers must furnish a Bill of Lading. An additional fee is charged to cover additional paperwork for non-contracted shipping companies. Can I pick up my order myself? Yes. Once you call ahead and schedule a pick up time (between 2:00 pm and 5 pm), you can pick up your order at the Tent and Table Distribution Center located in Buffalo, NY. There are no extra packaging fees if our products are loaded on your truck and/or trailer. All customer pickups must be prepaid and have the pickup date and time scheduled. I don't have a truck dock or the space for the delivery, can I pick up my order at the carrier's freight terminal? Yes. Freight companies have hundreds of terminals located throughout the USA & Canada. We can find the closest freight terminal to your p>location. Once your shipment arrives at the terminal, the freight dispatcher will give you a call to arrange pickup within 48 hours of the call. Due to the range of terminal operating hours and loading procedures, you may want to call the terminal in advance to ask about procedures. Terminal pick up requires identification, and most locations will load the product into a trailer or pickup truck. This commercial grade, lightweight 6-foot folding seminar table, provides stability and extra legroom, the perfect size for training rooms - allowing for increased classroom seating capacity, by placement of more training tables into a single classroom. These folding tables are produced by one of the highest quality manufacturers of folding tables, banquet chairs and stack chairs. These lightweight folding training seminar tables are well suited for use with folding chairs. Used Items will ship within 15 days from date of purchase to ensure adequate preparation time. This is a used table from our current Rental Fleet. This commercial grade used table has been rented this season. This table may have some discoloration and stains and may require a light cleaning. USED PRODUCTS ARE SOLD "AS IS", "WHERE IS" WITH ALL DEFECTS KNOWN OR UNKNOWN. ALL SALES ARE FINAL. NO RETURNS, NO EXCHANGES AND NO WARRANTIES OF ANY KIND EXPRESS OR IMPLIED. Tops - Clear faced plywood: 3/4" thick Birch wood, sanded smooth, without voids and patches, sealed on both sides with protective polyurethane finish. Edging - Crimped Aluminum Edge Molding is high-pressure crimped to the top. Under structure - Wishbone shaped legs. Leg material - 1" diameter, 16-gauge, cold-rolled, silver powder coated steel tubing. All metal parts are powder coated. Black plastic glides pressed into ends of legs. Hinged diagonal brace allows legs to fold. Locks positively in opened and closed positions. Secured to top with flush flat head carriage bolts, lock washers and nuts. Full length wood runners attached with carriage bolts and nuts stiffen top and facilitate stacking. For over 25 years we have been in business setting up, delivering, and distributing commercial grade bounce houses and equipment. We also offer a variety of wedding tents, which include pole tents and frame tents with banquet chairs and banquet tables. Copyright © 2015 TentandTable.Net. All Rights Reserved.